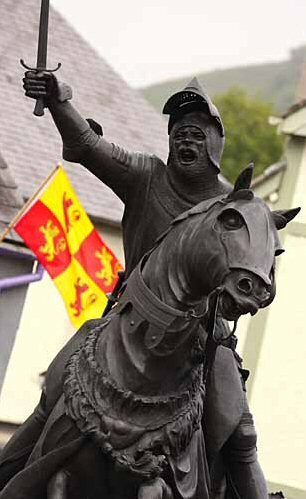 Owain Glyndŵr lived over 600 years ago and yet today remains one of the most heroic figures in Welsh history. Owain was a natural leader and an astute statesman who united and led the Welsh against English rule. However, in some senses Owain was the spark that ignited the Welsh discontent about specific issues in Wales, many dating from the death of Llywelyn the Last, who was killed in 1282. Iolo Goch, in many respects Glyndŵr�s household poet, provides us with an indication of Glyndŵr�s respect for the labouring class in his poem to the ploughman. 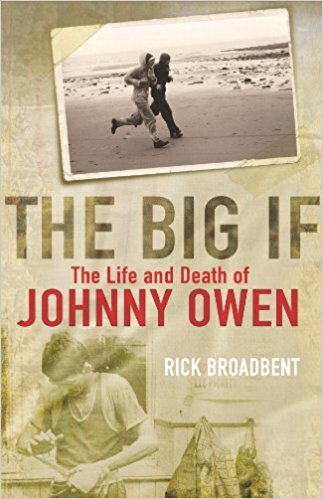 Iolo praises his fundamental role in society � �Nid bywyd, nid byd heb ef� / �there is no life, no world without him.� The fact that Welsh labourers left their livings and returned from England to support Owain Glyndŵr is evidence of his charismatic influence as the leader of a Wales free from the yoke of English rule. 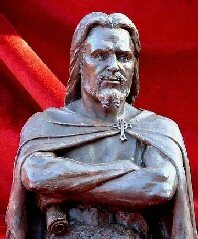 It is not certain when or where Owain Glyndŵr was born - possible dates are 1349, 1354 or 1359 and the two most likely places are the family home at Sycharth, near Croesowallt (Oswestry), or in Trefgarn, Pembrokeshire where one story says that his mother was visiting at the time of his birth. Owain�s family had estates at Sycharth, Iscoed in the Teifi Valley, and Glyndyfrdwy, in the Dee Valley. Iscoed was inherited by his mother, Elen, whilst Glyndyfrdwy was described as a �fine lodge in the park.� He probably spent much of his childhood at the family home of Sycharth. His lineage, a vitally important factor to Welsh people in the fourteenth century, was impeccable. When Owain Lawgoch was killed by an English assassin in 1378, the male line of the Gwynedd dynasty, which had led the resistance against the Anglo Norman invaders since the 11th century, ended. Owain claimed direct descent from the two other major Welsh dynasties, the princes of Powys in Mid Wales and Deheubarth in South-West Wales. On his father�s side, he could trace his ancestry back to Bleddyn ap Cynfyn, ruler of Powys in the eleventh century, while his mother�s lineage stretched back to Rhys ap Tewdwr, Prince of Deheubarth in the late eleventh century. In the 1380s and 1390s Glyndŵr studied law at the Inns of Court in London. This decision was almost certainly prompted by his father in law, Sir David Hanmer, an English judge who settled in Wales following his marriage to Angharad, the daughter of Llywelyn Ddu ap Gruffudd ab Iorwerth Foel, one of the most prominent Welshmen in nearby Chirkland. One of their holdings was the village of Hanmer, which they took as the family name, and Owain was married in the village church to David's daughter Marred. In September 1400, Owain Glyndŵr embarked on a course of action that would become one of the most dramatic episodes in Welsh history. His longstanding quarrel with Reginald de Grey of Ruthin over some common land took a surprising turn when Owain marched on Ruthin thereby instigating the Welsh Revolt against the rule of Henry IV of England. After destroying the town, Owain went on to attack towns all over north-east Wales as the revolt turned into a full scale war with the English crown. Welshmen from all walks of life flocked to join Owain's cause, and by 1403 nearly the whole of Wales was united behind Glyndŵr. For a while, it seemed that the vision of an independent Wales had not died with Llywelyn ap Gruffudd in 1282 after all. These events led to Owain formally assuming his ancestral title of Prince of Powys on 16 September 1400. With a small band of followers which included his eldest son, his brothers-in-law, and the Bishop of St Asaph in the town of Corwen, he launched an assault on Lord Grey's territories. After a number of initial confrontations between King Henry IV and Owain's followers in September and October 1400, the revolt began to spread in 1401. Much of northern and central Wales went over to Owain. Henry IV appointed Henry Percy � the famous "Hotspur" � to bring the country to order. Hotspur issued an amnesty in March which applied to all rebels with the exception of Owain and his cousins, Rhys ap Tudur and Gwilym ap Tudur, sons of Tudur ap Gronw (forefather of King Henry VII of England). In 1402, the English Parliament issued the Penal Laws against Wales, designed to establish English dominance in Wales, but actually pushing many Welshmen into the rebellion. In the same year, Owain captured his arch enemy, Baron Grey de Ruthyn. He was to hold him for almost a year until he received a substantial ransom from Henry. In June 1402, Owain defeated an English force led by Sir Edmund Mortimer at the Battle of Bryn Glas, and Mortimer was captured. Glyndŵr offered to release Mortimer for a large ransom but, in sharp contrast to his attitude to de Grey, Henry IV refused to pay. Mortimer's nephew could be said to have had a greater claim to the English throne than Henry himself, so his speedy release was not an option. In response, Mortimer negotiated an alliance with Owain and married one of Owain's daughters. It is also in 1402 that mention of the French and Bretons helping Owain was first heard. The French were certainly hoping to use Wales as they had used Scotland: as a base to fight the English. In 1403 the revolt became truly national in Wales. Royal officials reported that Welsh students at Oxford University were leaving their studies to join Owain, and Welsh labourers and craftsmen were abandoning their employers in England and returning to Wales. Owain could also draw on Welsh troops seasoned by the English campaigns in France and Scotland. Hundreds of Welsh archers and experienced men-at-arms left English service to join the rebellion. 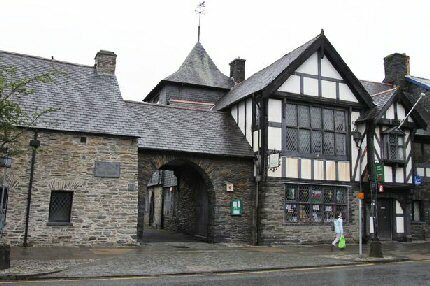 In 1404, Owain held court at Harlech and appointed Gruffudd Young as his Chancellor. Soon afterwards, he called his first Parliament (or Cynulliad or "gathering") of all Wales at Machynlleth, where he was crowned Prince of Wales and announced his national programme. He declared his vision of an independent Welsh state with a parliament and separate Welsh church. There would be two national universities (one in the south and one in the north) and a return to the traditional law of Hywel Dda. Senior churchmen and important members of society flocked to his banner. English resistance was reduced to a few isolated castles, walled towns and fortified manor houses. However, despite these astounding early victories the rebellion would ultimately fail as it suffered from key weaknesses � particularly a lack of artillery, which made capturing defended fortresses difficult, and of ships, which made their coastlands vulnerable. The uprising was eventually suppressed by the superior resources of the English. By 1408, the revolt was dwindling as swiftly as it had swept into being; by 1410, its inspirational leader had become a fugitive. Glyndŵr avoided capture and the last documented sighting of him was in 1412. He twice ignored offers of a pardon from the new king Henry V of England, and despite the large rewards offered, Glyndŵr was never betrayed to the English. It is not known for certain what happened to him after the revolt, he simply disappeared. With his disappearance Owain Glyndŵr acquired a mythical status as the hero awaiting the call to return and liberate his people.